Welcome to our school site! Below you will find many items that hopefully will prove helpful to your own classroom - be it either in a school or at home. 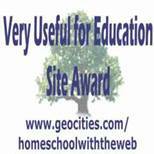 The site was originally intended to showcase some of the items my children were doing in their home classroom, but as time has passed, this site has come to be more of a ministry for homeschooling families throughout the world. I am both thrilled and humbled by that! I sincerely thank all of you who have taken the time to write me and tell me how you have used this site. At this juncture, I have heard from other countries beyond my own of Canada, Britain, Australia, New Zealand, and Africa - many of those in situations where homeschooling is not as easy of a choice as it is in the United States. In that vain, we have become less showcase and more sharing of our school materials that I've developed in hopes that we can continue to minister to those who have a heart for their children and a desire to teach them more of the Lord. Please sign our guest book if you find this site helpful. It is those comments and those who have written to me personally who have helped direct the development of this site. Blessings!